Summer days are more than poolside lounging in your bathing suit or neighborhood BBQs in your favorite flirty sun-dress. Fulfilling daily tasks such as running errands, grocery shopping and car-pooling the kids dominates many hours of the day, but it’s no reason to let your fashion fail. Keep your outfits comfortable, cool and cute with these practical styling tips. You’re guilty of the dreadful “uniform.” You step out of the house in rotated cotton gym shorts paired with stretched-out tank tops in a rainbow of colors and shower flip flops. Another repeat offender is going public in college t-shirts that should be worn carefully; even your bed is offended if worn to sleep in. Lastly, violators pull together these resentful ensembles with a lame ponytail or messy bun. Keep shower flip flops in the college dorms. Shimmery metallics, sparkles and gems are decorating sandals and bare feet this season. And these sandals aren’t all impossible heels or high wedges. Kenneth Cole’s Reaction line is featuring Glam Girl sandals in a variety of colors that have support, a comfortable shape and an actual shoe to slip your foot in to. For a more casual look, invest in a pair of Havaianas, boasted as truly the best rubber sandals in the world – soft as marshmallows, light, and highly durable. Pick among crazy prints and color patterns. Replace the decade-old, baggy t-shirt with form-fitting, comfy tees for an active-lifestyle. Lucy has numerous tanks and t-shirts adorned with trendy floral prints and nature-inspired patterns. Sun dresses this season are also casual enough to wear out and about during the day. Old Navy offers various sun dresses in different styles fitting for different tastes and body shapes. The women’s Polo or Jersey dresses are great options for a good deal. Save the cotton shorts or black yoga capris for the gym. The supermarket may not be the runway, but it’s no reason to shed complete self-respect. Lucy is a great resource for comfortable and quality active clothing that can be worn to exercise in or for every day wear. A great new Lucy arrival is the knee-length sightseein’ short, a flowered-camouflage cargo short that’s completely versatile and lightweight for the warm weather. Tennis skorts also are a breezy and feminine approach to creating a practical outfit for carpooling. 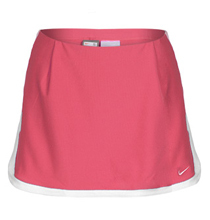 Try Nike’s in a flirty pink color. Although the angled shag is very chic season, especially for accenting the lower neck, there are some fashionable accessories for longer hair. Adorn your hair with an extravagant , one-of-a-kind piece from the Tarina Tarantino collection, designer accessories adored by celebrities. 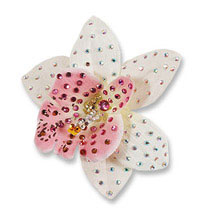 The silk orchid bobby pin is a great option for summery femininity. Or sweep hair off the face with a floral-printed, silk, hand-wrapped Rachel Weissman headband from San Francisco’s Jest Jewels, also available to order online.